I really wanted to at least try drawing some of the Mother’s Day flowers while they were still pretty fresh. So, here they are. Some sketches, at least. A bit unfinished, but it’s a start! They turned out to be rather loose interpretations, but at least you can recognize them…..I think. I could have gone back and given them a little definition with the Micron pen, but I decided to leave some sparkles of white paper, and see if they could be recognized on their own. I do think this next one could have done with some definition, but I’m going to leave it alone this time, I think. I’m encouraged enough by my progress with flowers to keep on with them, but ideally, I’d love to paint them in watercolor, in a very loose, impressionistic way. But that’s a challenge for another day. I hope you enjoy them. I’m sure I’ve said this before, but in my opinion, the Polychromos colored pencil and the Stonehenge sketch pads are a perfect marriage of paper and medium. The first four images were created in this way, and I guarantee you that had I used ink, watercolor, graphite, anything else but the Polys in the Stonehenge….they wouldn’t look nearly as good. 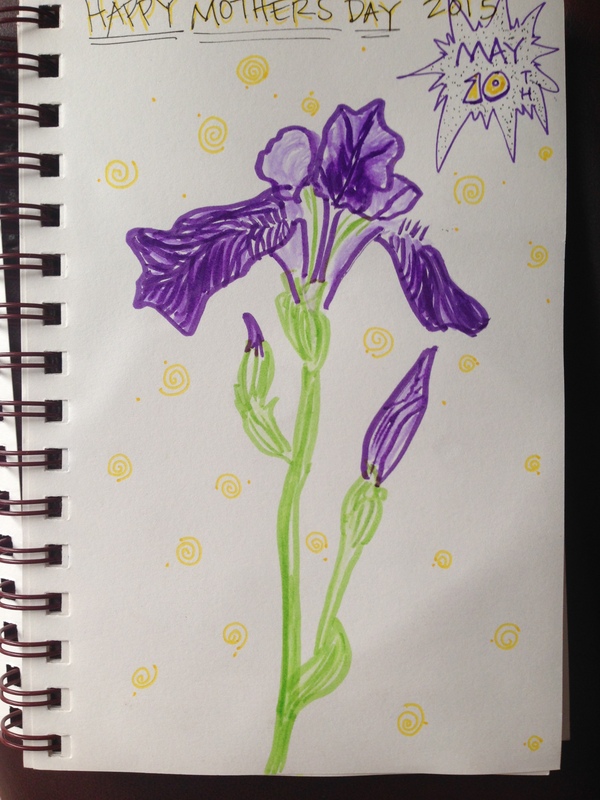 Kerfe, this last one is for you: my very loose Tombow marker sketch of one of Hub’s irises in my art journal. If you all would like to see some beautiful iris renderings, check out Kerfe & Nina’s blog here. < Look, a Horse! Well, almost. Beautiful Momma!!! You’re rockin’ the flowers! Can’t wait to see the “loose” watercolors! Thanks Ann, for your wisdom and encouragement! :))). If I could do them in watercolor…..hehe. I still need to improve the drawings first, I think. And maybe working small might help. Make it a bit more approachable. Lovely! 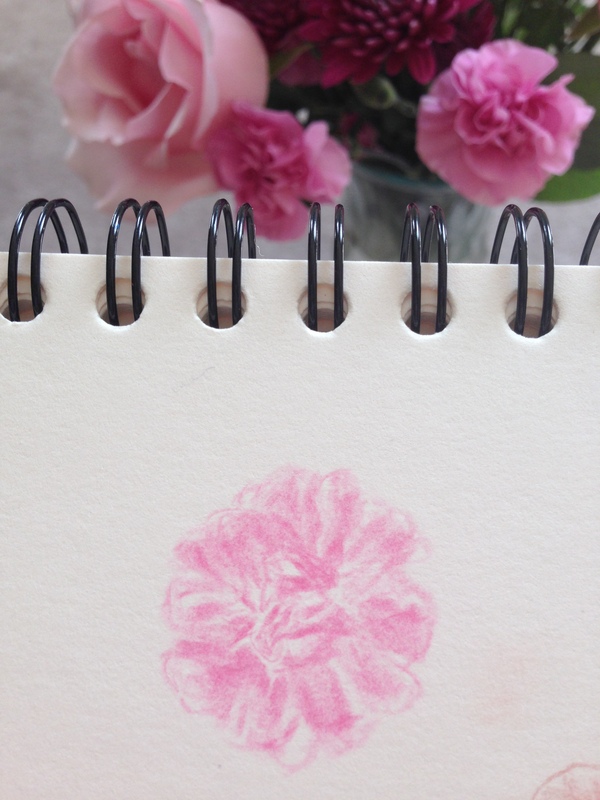 Your roses are gorgeous, and not an easy flower to sketch. 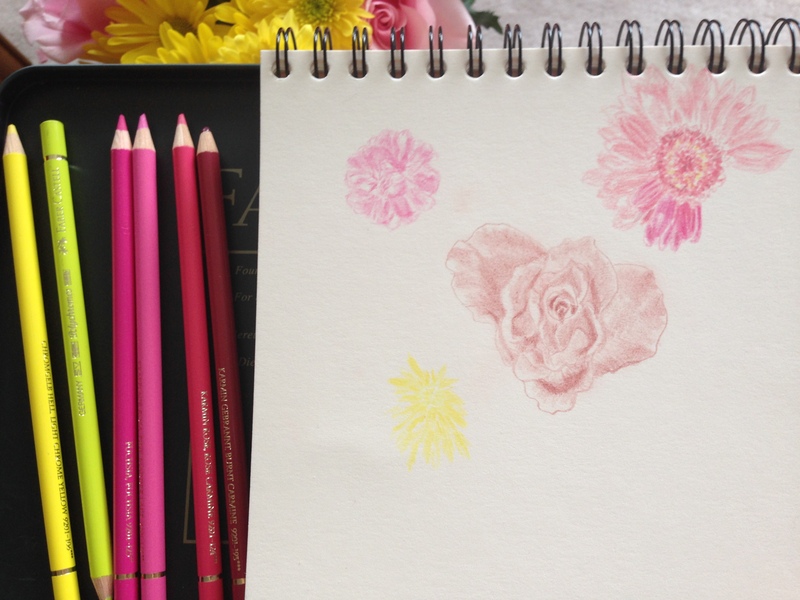 You ‘ve inspired me to draw some flowers. Haha, how did you guess? I was thinking about just using the red Tombow with blending pen for and exercise. I’ll post next week. Oh, nice! I’ll look forward to seeing what you come up with. I’m sure to be inspired! Sharon, do you blog on three days only for time management? I’m starting to wonder if blogging every day is really such a good idea. It’s turning into quite a timesucker!! I do enjoy it but I wonder if I should cutback some. Your thoughts? That rose is spectacular! I do think you have a feel for colored pencils. You really get contrast in texture and tone, and I love the layering. The iris makes a great card…and thanks for the link. Thank you! I’m glad you like it. I was drawing at night, on the floor, in front of the O’s game. I’d dragged the vase down too so I was looking down into the rose. Gave me good contrast with the lighting. I’d like to get them down better (drawing) before trying to paint them in WC but I’d really love to be able to do that. You’re welcome for the link! The iris was tough!! So I went fast. Sometimes that helps. And you can’t erase marker. Bonus. Yeah, I tend to agree at this point. Thanks, Sharon! Lovely! Thank you for sharing your amazing talents! Thank you so much, Irati!! Thanks Jill! That’s a good thought, but I guess I’d have to do WC first because there’s a bit of wax in the Polys. Hmm. I’ll see. I’d like to do WC only if possible. I can do a somewhat decent rosebud in WC. The inside of the rose would be harder. These are gorgeous! Really love your roses! No worries!! Thanks for sharing!!! Aww, that’s nice! 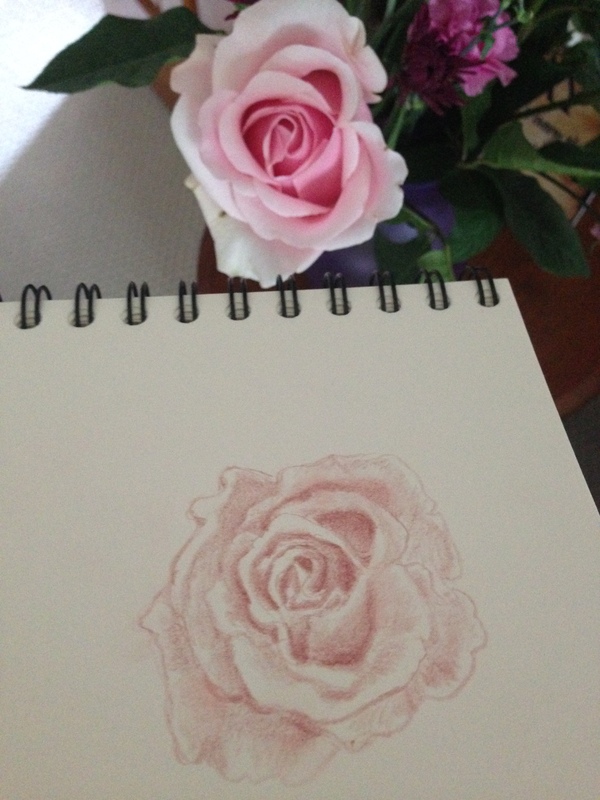 Roses aren’t easy to paint! I didn’t know you were a painter too. Quite a lot of talents you have!